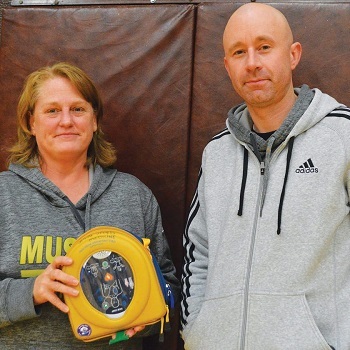 Photo by Jenny Kirk Head athletic trainer Laura Crowell and head men’s basketball coach Brad Bigler took time to pose with the automatic external defibrillator (AED) that helped save a game official's life recently at SMSU. MARSHALL — Without immediate treatment, nine out of 10 victims of sudden cardiac arrest (SCA) lose their life. It’s a leading cause of death and a major health problem in the United States. But when bystanders intervene by giving cardiopulmonary resuscitation (CPR) and using an automated external defibrillator (AED), survival rates can double or even triple. On Sunday, sports medicine staff from Southwest Minnesota State University and Wayne State College joined a handful of others in saving basketball referee Jeff Schroder’s life. An AED is a device that allows bystanders to provide lifesaving treatment to a cardiac arrest victim. When opened and switched on, the device gives verbal instructions to the user so that a lifesaving shock can be administered. “It starts talking to you right away and tells you what to do,” Crowell said. The device tells the user to remove clothes from the patient’s chest and then where to place the pads before it accesses the victim’s heart rhythm and determines whether a shock is required or not. Crowell added that no one could put a price on saving a life. Years ago, schools and other public facilities began acquiring the lifesaving device. Many would argue that there still aren’t enough placed in public places. Crowell said she spotted the portable type of AED while at a hockey game. While gymnasiums are a logical place to have AEDs present, not all of them in the area have the device. “I’ve heard from a lot of people that they officiate in places where they don’t have them,” Crowell said. While emergency situations aren’t a common occurrence, they do happen. Lind said she doesn’t recall an official collapsing on the court during an NSIC game before Sunday’s incident, but there have been similar ones. According to the American Heart Association, 80 percent of Americans do not know how to perform CPR, which is why the organization sponsors inexpensive certification courses in communities all across the nation. Being prepared could significantly decrease the number of annual deaths due to sudden cardiac arrest (nearly 400,000). But oftentimes, CPR alone is not enough since it is a temporary measure that maintains blood flow and oxygen to the brain. It cannot return a heart to a normal rhythm during ventricular fibrillation or ventricular tachycardia. AEDS are far more effective for cardiac arrest patients than CPR. According to the Red Cross, these steps should be used when assisting a non-breathing adult or child aged 8 or older who weighs more than 55 pounds. 1. Turn on the AED and follow the visual and/or audio prompts. 2. Open the person’s shirt and wipe his or her bare chest dry. 5. Push the “Analyze” button (if necessary) and allow the AED to analyze the person’s heart rhythm. 6. If the AED recommends that you deliver a shock to the person, make sure that no one, including you, is touching the person and tell everyone to “stand clear.” Once clear, press the “shock” button. 7. Begin CPR after delivering the shock. Or if no shock is advised, begin CPR. Perform 2 minutes (about 5 cycles) of CPR and continue to follow the AED’s prompts. If you notice obvious signs of life, discontinue CPR and monitor breathing for any changes in condition. Note: During CPR, you should push on the chest at a rate of 100 to 120 compressions per minute. The beat of the Bee Gees’ song, “Stayin’ Alive,” is a perfect match for this.